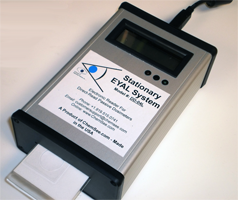 The EYAL Stationary Electronic Reader is a versatile monitoring system for exposure of personnel, vehicles and static locations to toxic gases and radiation. The EYAL system allows for fast, quantitative determination of exposure levels of multiple employees or locations to toxic gases or radiation. The same reader can be used to monitor a wide range of toxic gases. Additionally, multiple, non-destructive readings can be taken on a single dosimeter to allow assessment of the exposure in specific operations or locations. Stationary Quantitative Reader for ChemSee Dosimeters. Comes with Digital LCD Readout of Exposure Levels for Employees. Outputs, Stores, and Logs all Data on a Nearby Computer so Gas/Radiation Exposure can Easily be Tracked. Stationary Quantitative Reader for ChemSee Dosimeters. Outputs, Stores, and Logs all Data on a Nearby Computer so Gas/Radiation Exposure can Easily be Tracked. The reader analyzes the difference in color between the sample and control portions of the dosimeter and calculates the exposure dose based on the toxic gas of interest.